We’ve spent the entire week getting to know the Husqvarna Viking Designer Jade | 35. It really and truly is a beautifully designed sewing machine. However, it’s way more than just a pretty sewing machine – it sews beautifully as well. Today we’re going to have a look at winding bobbins. A well wound bobbin is critical to getting a nicely formed stitch and good tension. If the thread on the bobbin isn’t tightly or smoothly wound, the tension will likely be out of whack. We know from my discussion about tension yesterday that there’s no point in sewing if the tension isn’t right. As would be expected, bobbin winding mechanisms are different for every sewing machine. The Jade | 35 is no exception. I actually had to get out the User’s Guide, read the section on winding bobbins and study the diagrams. Let me tell you that I LOVE this system for winding bobbins and it was well worth my time to read and learn the process. On one of my older sewing machines, there’s just ONE guide for the bobbin thread when it’s being wound. There are times when that thread will pop out of that single guide and the tension is a mess and I have to rewind the bobbin. There’s no danger of that happening on the Jade | 35. 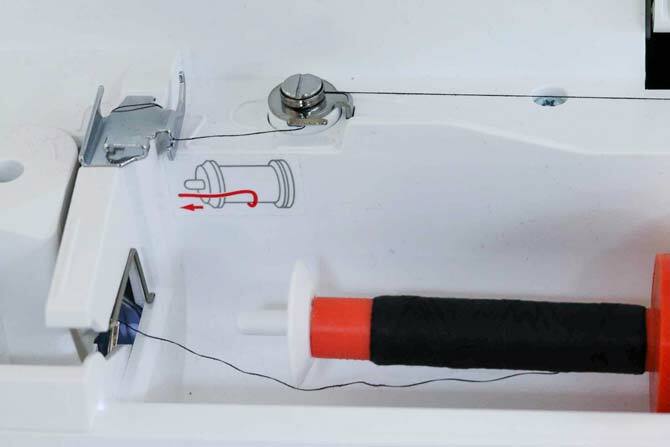 There are four guides that the thread has to go through before it goes through the tension dial for the bobbin winding. Hmmmmm – I’m afraid to look, but maybe this has been my problem all along with my own sewing machine. I more than likely didn’t read the manual on winding bobbins and have probably been doing it wrong all these years. I better dig that manual out and have a look. All that to say that I was very impressed with how the bobbins were wound. Yes – it’s quite different from what I’m used to and yes it was fiddly to figure out, but that perfectly and tightly wound bobbin is certainly worth the price of a five minute learning curve. I did learn something that wasn’t in the manual. And this is a very important tip. I’ve touched on it in prior posts about other Husqvarna Viking sewing machines. When I was sewing, I was using the same brand of thread, but the spool was much fuller. I was using the big spool cap – there’s a picture further on today to show you that set up. I wanted you to be able to see the path was taking, so I used black thread to wind onto the bobbin. Notice that the spool is almost empty. I popped on the large spool cap, threaded the machine for bobbin winding and pressed START/STOP to wind the bobbin. SNAP – the thread broke. What? So I repeated that process, pressed START/STOP and SNAP – the thread broke again. OK – first time may have been an error in the threading process. But I double checked – everything was fine. Second time you know there’s a problem. I changed the thread cap to the smaller size and notice the position of the thread cap – the flange is pointed outward from the spool of thread. This time when I hit START/STOP – that bobbin wound with no further issues. So if you think – ‘oh those silly little thread caps aren’t that important’, they are very important! 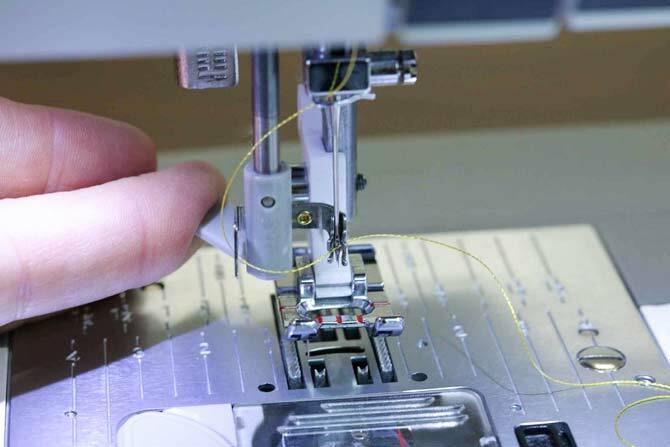 Should you be having difficulty with thread breakage, this is one more area to check. I have noticed in other situations that the amount of thread left on a spool can affect things like the tension as well – so put this on your list of things to check when threads break. And here’s my perfectly wound bobbin. My spool of thread finished before the bobbin was completely full. But that bobbin was beautifully wound – nice and tight. Note in the picture below – I took the bobbin off the bobbin winder. I wanted you to see that my spool of thread was empty and see the bobbin at the same time. You can also wind the bobbin through the needle. My preference is to wind the bobbins from the horizontal position, but sometimes when I’m in a hurry and need a bobbin right away, I’ll wind my bobbin through the needle. Very important to remember to bring the thread under the presser foot to take the pressure off the needle. The presser foot is stronger than the needle. Make sure you’re using a metal presser foot when winding bobbins this way. On the front of the Jade | 35, you can see two metal bars at the top and bottom of the function panel. Those metal bars protect the sewing machine case from scarring by the thread when winding the bobbins. 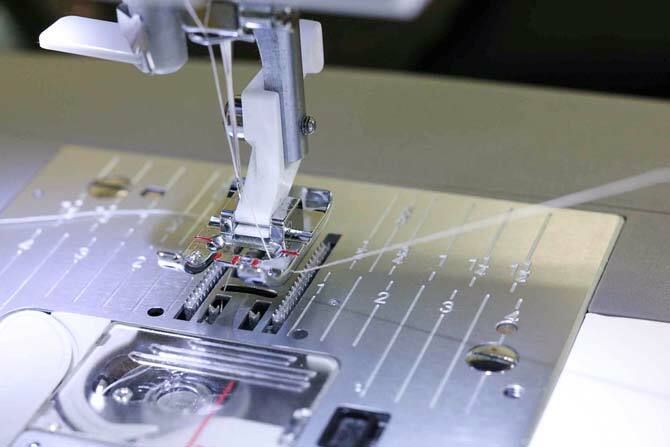 Thread is very fine and at a high speed can cause grooves to form on the case. The metal bars prevent that from happening. There’s a metal guide at the top as well to guide the thread into the bobbin when you are winding bobbins. In the photo below – you can see the larger spool cap is being used. 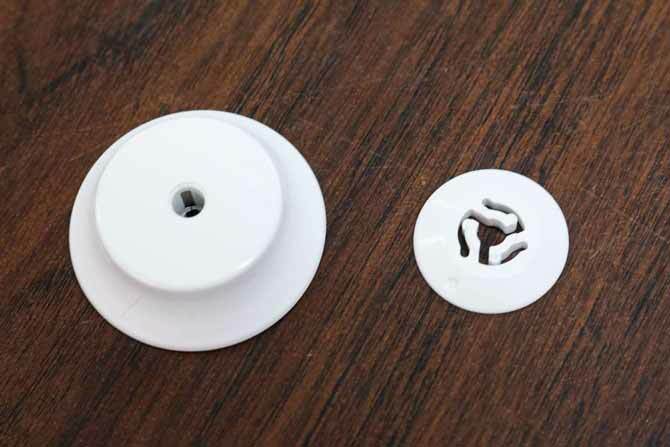 The spool caps can be used in either direction depending on the size of the spool of thread and how full it is. There are two spool caps – a big one and a small one. If one doesn’t work (and you’ve tried it in both orientations), then try the other size – again in both orientations. No one likes to run out of bobbin thread, but let’s face it – it’s going to happen. Since I use the same color thread for all my piecing, I like to wind four bobbins and keep them handy. When one gets empty, I have a new full one to pop in. My rule of thumb is use four bobbins and then change the needle and clean the lint out of the bobbin case. 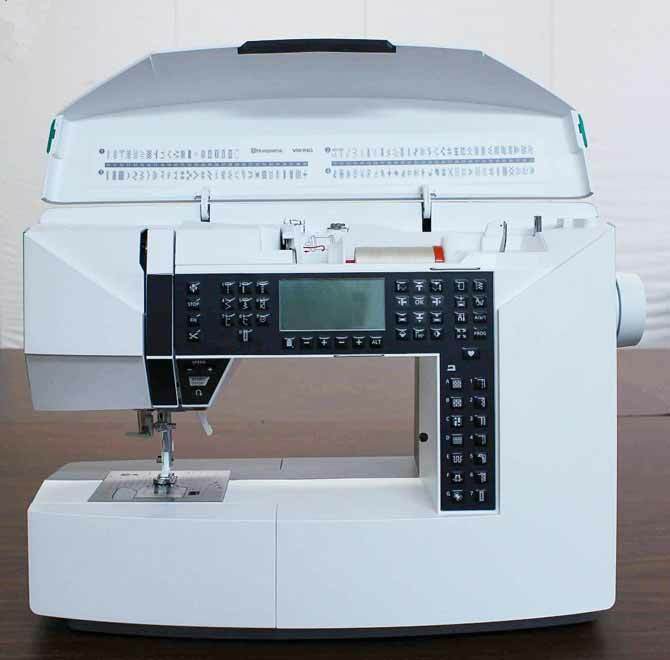 Good sewing machine maintenance goes a long way to ensuring that your sewing machine is always ready and will provide you with a good tension for many years. The other tip is about using invisible thread in the bobbin. 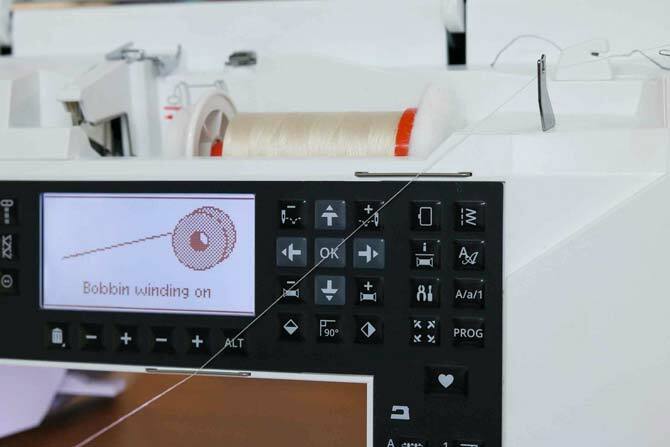 If you choose to use invisible thread in the bobbin (personally I don’t like it in the bobbin – there are many other options like bobbin weight polyester threads). 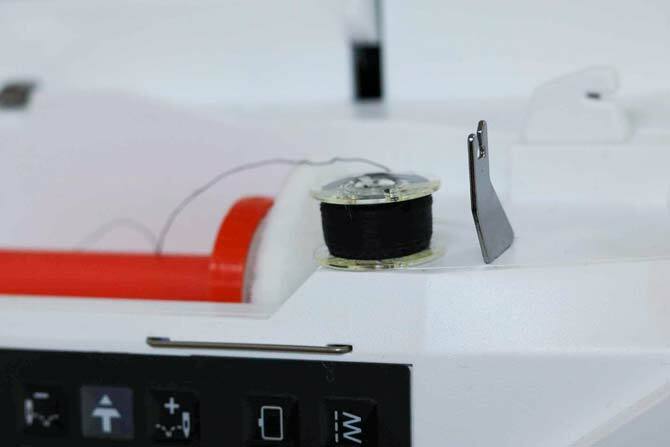 But if you do wind a bobbin with invisible thread, reduce the speed of the sewing machine during the bobbin winding process. Also, only wind the bobbin half full. A lot of pressure occurs when winding the invisible thread and I’ve seen it happen where the bobbin will snap from the pressure or it will become so compressed that you can’t remove the bobbin from the bobbin winder. Normally I don’t touch needle threaders. It takes me a long time to get used to using it and I’m lucky to be able to thread the needle by hand. I know – sometimes it’s hard to teach an old dog new tricks! But I was changing threads a lot and I thought to myself “why not try the needle threader?” So I did. And you know what? It worked perfectly the first time and every subsequent time! Sometimes the hook is hard to get into the eye of the needle, but this hook just popped right through, grabbed that thread and the needle was threaded before I knew what was happening. I LOVE this needle threader. There you have it – a good overview of the Husqvarna Viking Designer Jade | 35. A beautifully designed, feature rich sewing machine that also has embroidery capabilities all in one nice reasonably priced package. There just isn’t time in a week to describe all that the Designer Jade | 35 has to offer. We’ve already seen that it sews beautifully, but stay tuned because we’re going to explore its capabilities in applique, quilting and embroidery the next time around. Stay tuned! Have a great day! Ciao! I am doing embroidery, so i am using embroidery bobbin thread, i have nothing but trouble. some of the bobbins are cracking, busting in half, but most annoying is i can’t get the bobbin off after its finished. the only way it will come off is by taking all the thread off. i have wasted so much thread. if i only put a little bit on, i mean about 1/4 of the bobbin, then it will come off. but by doing that i am always putting in a new bobbin. I loved reading your review, and wholeheartedly agree that this is a superb machine, my only gripe about it is that it is tricky to remove and replace the screw when needing to replace the foot with, say a walking foot, I find the space between the machine and its base plate is very tight, do you have any tips on how to do this more easily? First day with My Husqvarna Viking Designer Jade 35 Machine I’m in love with Purchased it for 1,623.00 it’s Kinda heavy nice Storage small space but I can work around that. Only problem is that my bobbin ain’t winding can’t figure it out. It only came with one bobbin and no usb.